Not even the ice storm of the year could keep us off the dance floor!!! The Artistica Team made a splash at the beautiful Showcase hosted by the wonderful Kateryna Stytsenko and Dimitry Ilyushenov on April 14th. There were 11 dancers (a record!) as well as our three teachers so we were one of the largest studios at the event! YAAAA Artistica!!! And a special thank you to all of our wonderful students who came out to support and cheer on the dancers!!! We all especially liked that all the students received personal feedback from the judges for each of our dances – SOOO helpful! The wonderful Wendy Johnson came in from New York to judge the event and provide comments for students. 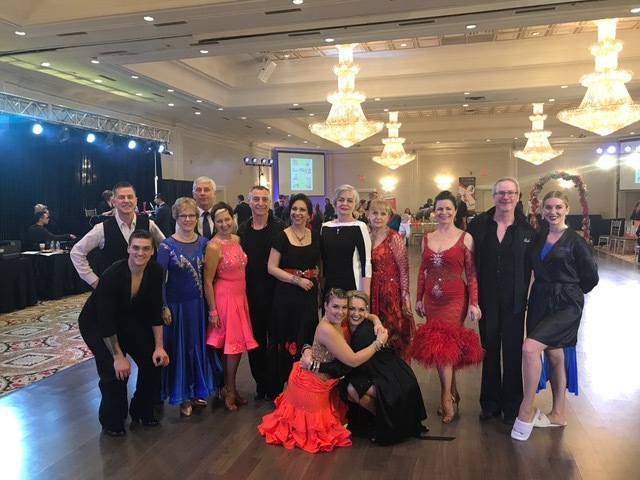 The evening show was especially beautiful and included our own Anastasia and Patrick who danced two very special dances along with other professional couples. And it was so much fun to have lots of general dancing during the evening! All in all it was a terrific experience – we are all looking forward to more events in future with this amazing group of people.